We've all become accustomed to seeing scores of empty seats behind home plate at Major League ballparks these days when watching on television, catching highlights or there in person. Many parks now have these exclusive areas right down by the field that allow lucky fans to see if the clean-up hitter has dribbled tobacco juice on his jersey as they sit in padded seats and enjoy the services of a wait staff. And if it's too hot or cold outside or, heck, you're just bored, you can retire to a climate-controlled club behind you for more high-end eats and drink. The seats behind home and the dugouts, many rows up, were mostly empty as the game started, and remained about half empty throughout a tight contest. Otherwise the stadium was packed. The Yankees are getting no favors from the brutal economy, but they also brought this upon themselves. And they seem to know it. Hal Steinbrenner, running the show in the Bronx with his dad in partial retirement, acknowledged even before the opening game that "small amounts of our tickets might be overpriced." You think, Hal? Seats in the Legends section down near the field and behind the dugouts can go for as high as $2,625 a game. That's for one ticket. On Monday morning I logged on to the Yanks' Web site and could still get four seats in the front row for that night's game at that price. Add in a $59 service fee per ticket (I'm not making this up, check it out for yourself), and the total was $10,736 for me and the boys to go out to the ballpark. I resisted the urge, apparently like so many others. If I wanted to move back a bit into the Field section, I could get four at $375 per. Again, I decided to hold off. You need to go higher and far up the baselines until the prices drop below obscene. Then it actually gets close to reasonable, especially considering the sightlines at the new park are excellent: $30 for a seat in the upper deck, $23 down the lines, and $14 for a bleacher seat. But I couldn't get even two in any of these sections. You paying attention Hal (and team owners everywhere)? The Yankees have built a beautiful park, but they also seem to have reached the tipping point in escalating ticket prices. Fans, we're finding out, do have a threshold they will not cross. When the ticket price equals the monthly mortgage, maybe it's best to sit at home and watch on TV. For that maybe we can all thank the Yanks. Maybe this will lead to a reassessment of the luxury seating trend (which I'd love to know who exactly requested, anyway), and a leveling off of all ticket prices. 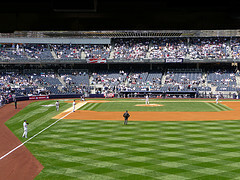 The Yankees, almost for certain, are going to have to react by lowering prices on those seats and offering rebates to those who bought season plans there. Either that or they better get used to explaining why the best seats for one of the most famous sports franchises in the world sit empty. And here's the most ironic thing in all of this is: Once the novelty of seeing the players up close has worn off, the seats right down by the field aren't even that good. You're much better off up a bit higher, say 10-15 rows back, where there's a nice overview of the field and you don't have to strain to see if the right fielder made that play at the wall. Here's guessing that folks (or corporations) who pay $2,625 to sit there don't really care if he made the catch.